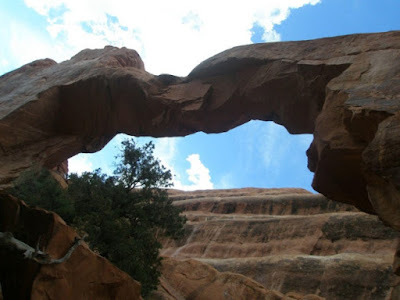 Yes, we have discussed arches and natural bridges in"Stone Arches, Bridges, and the Genesis Flood" and "Crumbling Landforms", the article linked below provides a very good treatment of the subject (and not everyone has read every post here, of course). Flaws in a new hypothesis by secularists are also mentioned. The article also clarified for me the difference between an arch and a natural bridge. If you get a notion to saddle up or hike so you can see natural bridges and arches, don't be going on them. Secularists claim they've been standing for millions of Darwin years, but the things have been collapsing of late. Uniformitarian geologists cannot explain the large ones, even though they are clearly the products of erosion. Small "windows" have been formed rather recently. Nobody has seen such structures forming, and their existence is baffling to uniformitarian geologists. Some of their ideas don't take into account all the facts and some basic geological science. Even so, the best explanations are related to the Genesis Flood. Not during, but afterward, including the massive erosion in the runoff of the waters. The origin of arches and large natural bridges is problematic for uniformitarian science. Many hypotheses have been suggested, but all depend upon slow processes of erosion over tens of thousands of years. The problem with this much time is that the large natural bridges and arches would have weathered and collapsed long before the material around them eroded. Geomorphologist C.H. Crickmay noted that for large natural bridges to form, its erosion rate compared to the stream channel has to be almost non-existent, which makes no sense when considering that a natural bridge in its beginning stage will erode fast by rock fall. To read the entire article, click on "The puzzle of large natural bridges and freestanding arches". We are continually bombarded by assertions that minerals-to-materialist evolution is true, so we should just accept it. Darwin's Flying Monkeys© are fond of patrolling teh interweb and pouncing on evolution deniers with tendentious "facts" (which are often outdated and creationists need to correct them). There are some simple questions that evolutionists are unable to answer with any degree of coherence. Of course , when Darwin's disciples are presented with evidence that does not fit their paradigm or questions they dislike, they often respond with abuse or verbal bombardment. (Actual scientists don't seem to spend much time trying to slap leather on social media.) Don't let fundamentalist evolutionists lead you on a trail of distractions. Sometimes they will claim they "answered" questions, but they gave nonsense, even appealing to "common sense". They are committed to naturalism and despise biblical creation. Essentially, those sidewinders want to slap the creation out of us. Almost everyone knows someone who believes in evolution. This matters because evolution contradicts Genesis, and the gospel rests upon Genesis. For example, Genesis teaches that God made Adam and Eve, but evolution teaches that nature somehow made us from ape-like creatures. The Bible teaches that Jesus is the last Adam—the first Adam brought death, but the last Adam brings life for those who trust Him. How can Christians converse with those who hold evolution’s radically different ideas? The following challenges might help remove evolution-based objections to the gospel. To read the rest, click on "Four Observations Evolution Can't Explain". 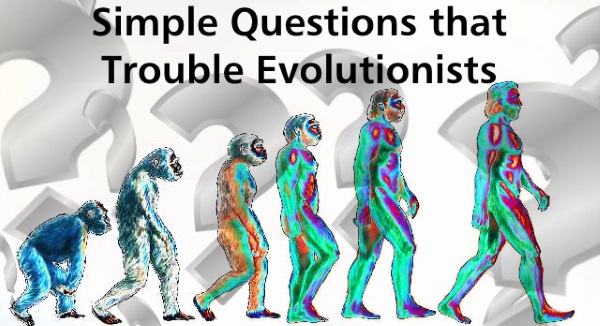 If you want to dig deeper, see the video by Mike Riddle, "Four Power Questions To Ask An Evolutionist" (the main content ends shortly after 45 minutes). There are some more advanced questions that receive simplistic non-answers, if you've a mind to see them with links to supporting articles, click on "15 Questions for Evolutionists". The word evil is commonly used, but it is often used incorrectly. When the James-Younger gang held up trains, banks, and stagecoaches, depriving folks of their hard-earned money could be considered evil. When they killed people, well, that was more evil. Nowadays, evil is often used to mean, "Something I dislike". (If you want to get a foundation of what is evil, the Bible tells you about both evil and salvation.) The dramatic term axis of evil is found in astrophysics. It refers to something that puts a burr under the saddles of Big Bang proponents. 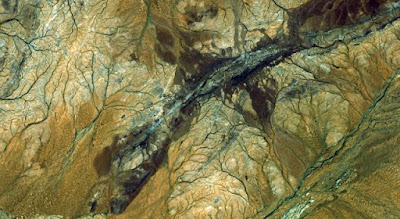 Planck enhanced anomalies image credit: ESA and the Planck Collaboration. To get a handle on this, some background on the Big Bang and cosmic evolution is necessary. Like Darwin and his disciples, cosmologists and cosmogonists believed in something that did not have evidentiary support. Instead, they waited for it. It was proposed that there would be background radiation after the Big Bang, and something was finally discovered. The Cosmic Microwave Background was picked up by instruments, even though there were still questions such as, "Is it actually cosmic radiation ? Are enough possibilities to explain the observed evidence considered?" Moving on from there, cold spots were detected. "Cold spots? 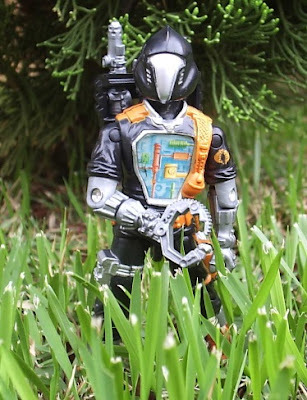 Are there ghosts in the universe, Cowboy Bob?" When it comes to dark matter (one of many rescuing devices for the Big Bang), naturalists seem to be trying to cling to ghosts. But I'll let that link be sufficient for the ghosts of space, coast to coast. Anyway, there are some cold spots in the Axis of Evil that cannot be explained and do not fit standard secular cosmic models. To make matters worse, the AoE aligns with the orbital plane of the planets in our solar system. More excuses for the Big Bang will have to be made because the truth — that God created the universe, and did it recently — does not fit their worldviews. In 1948, theoretical physicists predicted that if the universe began with the big bang, then the universe ought to be filled with a low-temperature radiation field. 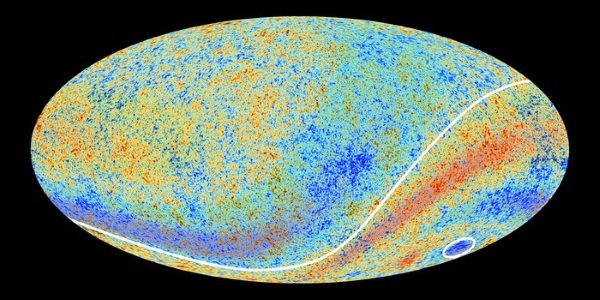 This radiation field supposedly resulted from an epoch 380,000 years after the big bang, when the matter of the universe had a temperature of about 3,000 degrees . . . According to the big bang model, since the creation of this radiation field, the universe has expanded a thousand-fold, reducing this temperature to a few degrees Kelvin (K), just a few degrees above absolute zero. This would place the radiation in the microwave part of the spectrum. In 1948, this was a moot point, because the technology to measure this radiation did not yet exist. However, by the early- to mid-1960s, the technology to detect this radiation did exist. In 1965, Arno Penzias and Robert Wilson discovered microwave radiation with a temperature of a little less than 3 K coming from all directions. 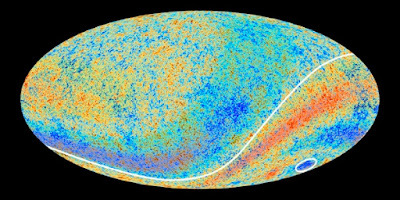 This discovery of the cosmic microwave background (CMB) was hailed as evidence that the big bang model was true. To read the rest, click on "The Axis of Evil and the Cold Spot—Sear-ious Problems for the Big Bang?" For an additional discussion, see "The 'Axis of Evil' in Astrophysics". Ironic observation: I used an "axis of evil" reference in an article a spell back. There is a plant known as the bird-of-paradise or crane flower (genus Strelitzia), which has a passing resemblance to the head of a bird. 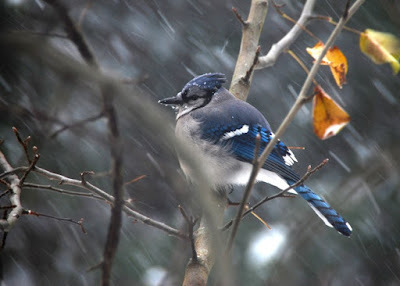 A bird exists by the same name, but that has no relevance except maybe for some similar color. You can find these perennial plants in South Africa and they can grow rather large. 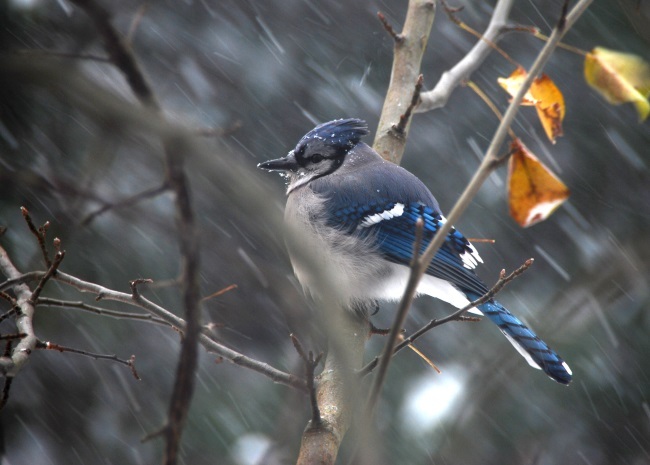 (Two species are hardy houseplants.) 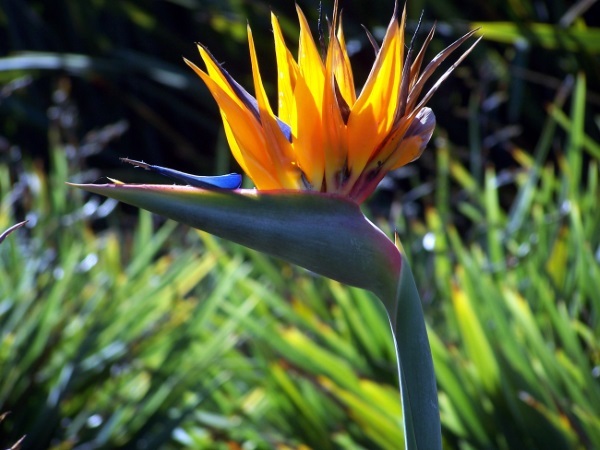 Strelitzia have a clever way of pollinating: when sunbirds perch on them to sip on the nectar, the flowers open to cover their feet with pollen. But that's not what bothers Darwinists. The bright orange coloring is due to pigment. In 2009, researchers were finally able to determine the source of the pigment. It is bilirubin, which is not found in the plant kingdom. No wonder the source was elusive. What is problematic for Darwinists is how bilirubin (which gives that yellowish tinge to that place on your arm when your cousin hit you, and also when people have jaundice) came to be in plants. 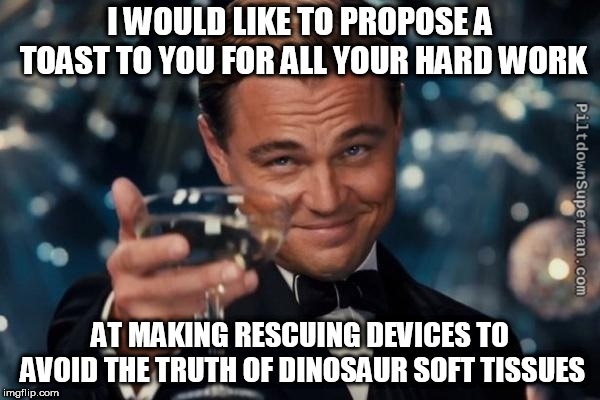 Instead of considering that the Master Engineer was involved in this, they tried mighty hard to work in some connection with evolution. Gotta keep the faith, baby! Aside from the widely recognized shape of their flowers, which resemble the head of a tropical bird, bird-of-paradise plants (Strelitzia spp.) are admired for their vibrant floral coloration. The brilliant orange is even more intense on the furry outside of their seeds, and is able to persist for decades,1 unlike most plant pigments, which degrade rapidly after cell death. Researchers, eager to investigate the source of such long-lasting and intense colour, set about to try to identify the pigment. To read the rest, click on "Bird-of-paradise flower pigment surprise". When an employer requires overtime, the employee is expected to work efficiently and accurately with available facts. Also, the use of intoxicants is not allowed. Seems that the hands at the Darwin Ranch (yonder near Deception Pass) are ignoring good work habits when they put in overtime at the excuse mill. Case in point, more shenanigans regarding soft tissues. When soft tissues were discovered in dinosaur bones and shown to be more than a fluke, evolutionists were stricken with the inability to explain what they considered impossible because they "know" that the earth is very old and that dinosaurs took a group dirt name millions of Darwin years ago. In today's exciting episode, we have some denial of reality with flagitious evoporn presented as science. A Jurassic ichthyosaur was found with more than just remarkably-preserved tissues, but also skin and blubber. Good science was used to discuss the biology, but they ignored the ichthyosaur in the room: the age issue. In addition, bad science was utilized with "convergence" and other science-free excuses. Another find involved a special bone found in egg-laying animals, is very fragile, and only exists for the laying of eggs. This was from a Cretaceous bird. Once again, we see more evidence of rapid burial due to the global Genesis Flood. Evolutionists are dodging hard evidence with an absurd excuse that soft tissue can last hundreds of millions of years. Soft tissue in fossils violates everything paleontologists thought they knew about deep time. Proteins, DNA and tissue were supposed to decay and be replaced by rock in mere thousands of years, perhaps tens or hundreds of thousands of years at the very most. Now, the evidence for surviving original material is beyond question. Two more instances have been reported this week. So are evolutionists giving up on deep time? The thought doesn’t even enter their minds. Instead, they claim that the evidence proves that soft tissue can indeed last millions of years, and that it can help Darwin by providing more evidence for evolution. Both claims are false. Soft tissue destroys deep time. These fossils were recently buried. To read the rest of this article and before moving on to the next installment below, click on "Two More Soft-Tissue Fossils Pile on the Evidence Against Deep Time". Mary Schweitzer suggested that dinosaur soft tissues were preserved by iron. She did a test under pristine laboratory conditions and extrapolated out to millions of unobserved and unobservable years, and Darwin's Flying Monkeys™ swoop down, playing "Gotcha!" with biblical creationists. Except that Schweitzer's ideas do not work, and evolutionists know it. That's why they keep working the excuse mill. Scientists often get inspirations for studies from unlikely sources. That's a good thing; it shows they are being observant and commencing to ponder sciency stuff. Consider toasted bread. It is still bread but has undergone some changes, one of which is getting darker. So, compare this concept with dinosaur soft tissues. Add in presuppositions regarding deep time, that Darwin was on the right trail, and dinosaurs went extinct en masse, then you get the toast "hypothesis". These owlhoots need to cowboy up and face the facts that Earth is not so old after all, and there was a global Flood. 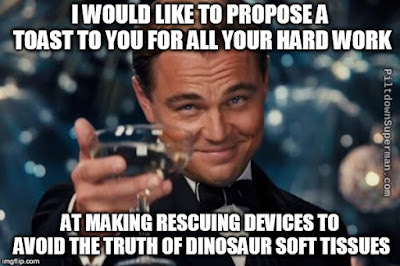 To read the rest, I propose that you click on "New Dino Soft Tissue Explanation Is Toast". You might be interested in a related article, "Soft Tissue Fossils Preserved by Toasting?" A couple of videos are below for fun and education. In Genesis 1:1, we see that God created time, space, and matter. God the Son, the second person of the Trinity, made everything (John 1:1-3, John 1:10, Colossians 1:16). After the six literal days of creation, God ceased his creative work. However, he had something else planned — he was going to do a "new thing". This new thing was that God the Son was going to enter his creation as the seed of a woman (Jeremiah 31:22, Genesis 3:15). Study on that a moment. Man, who was created in the image of God, sinned, so the Creator of the universe chose to enter creation. God the Son became the man, Jesus (Colossians 2:9, Romans 5:17, Matthew 1:23). He died on the cross for our sins and bodily rose from the dead. The only begotten Son made it possible for us to become adopted sons and daughters (Romans 8:15, John 1:12). 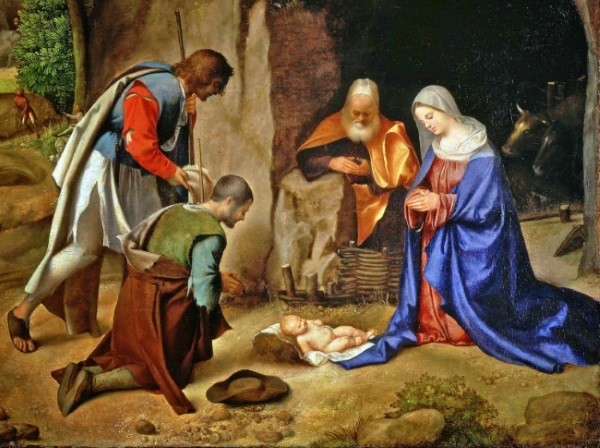 These are amazing reasons to celebrate Christmas. Hail the incarnate Deity! As they celebrate Jesus’ coming during the Christmas season, many Christians seem unaware that this child who was born, this Son who was given, has an even wider identity. I recently received a letter from one of our supporters who surprised me by saying “I urge you not to claim that Jesus is the Creator.” That is unusual, to say the least. Most of those who share their resources with the Institute for Creation Research are pretty much in agreement with our basic commitment that the Bible clearly portrays Jesus as the Creator, the Second Person of the Godhead, and the Redeemer and King. Let’s look at what Scripture has to say about it. To read the article in its entirety, click on "Creator, Redeemer, King". You have probably heard people claim, "It is simply common sense" as an explanation. This is similar to "everybody knows". If you study on it a moment, you might agree that "common sense" is actually a nonsensical phrase. Sometimes it is used when presenting scum-to-schoolchild evolution. Study a bit more, and you might also see that it can easily be an insult or a way to manipulate people, as it implies that if someone does not accept "common sense" evolution, that person is stupid. It is interesting that common sense supposedly evolved like everything else. Evidence? That'll be the day! Like people who decide that reality is based on materialism and rejecting our Creator, the common sense of evolution is based on unsubstantiated presuppositions. The truth is, wisdom and knowledge come from God, not the assertions of people with a materialistic worldview. In trying to convince readers that the Darwinian worldview is true, it is commonly argued that the case for evolution is ‘common sense’, as though this expression is solid proof that ends the argument. An example is the headline of one article that exclaimed: “Evolution is plain common sense.” Another example is the article “Common Sense ‘Expelled’ in New Movie”, which concludes that it is common sense that creation and Intelligent Design are false and evolution is true. Then there exists the “Common Sense Atheism” website that uses “common sense” to prove evolution and disprove Intelligent Design. 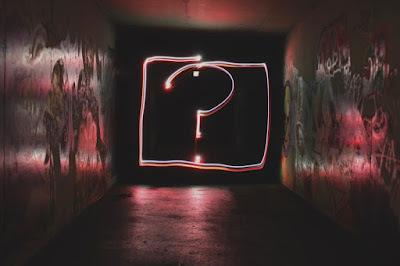 The term common sense is often used as “proof”, especially if the idea it is used to support is commonly accepted as fact by most scientists or the general public. If one concludes that it is obvious to him or her that evolution is correct, but cannot articulate why, “it is common sense” may be used as a reason. To read the rest of this very interesting article, click on "The ‘common sense’ argument for evolution". I missed out on the big money. At one time, this child had the notion that he'd be a right fair science fiction writer. Since I am not good at dialogue and story development, I gave up. It turns out that I should have pursued my interests in science, since naturalists saddle up some really wild ponies and gallop away with their strange ideas. The stuff is easy if you study on it. The public has a love/hate relationship with science, being suspicious on one hand but adoring scientists as priests and kings on the other hand. 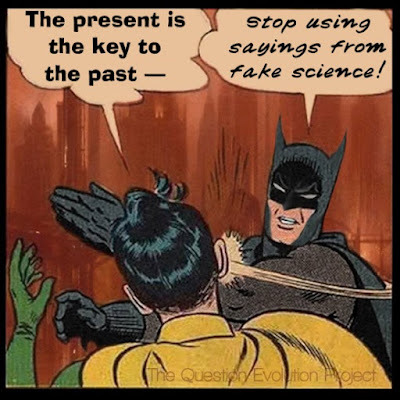 As many of us have observed, if people are told that "scientists say" or some-such, they tend to believe whatever it is. This makes things very helpful for materialists who seek to deny the work of our Creator. For that matter, people accept the dubious authority of the likes of Bill Nye the Not Really a Scientist Guy, Clinton Richard Dawkins, Neil deGrasse Tyson, Laurence Krauss, and other owlhoots that purvey evoporn. Ipse dixit becomes standard operating procedure. Another way that secularists succeed in spurious science is related to the first: There is an appalling lack of critical thinking skills being taught or utilized. People dare not challenge ipse dixit, and do not ask basic questions like, "How do you know? Got any evidence?" I have a suspicion that people accept some of this stuff because scientists and atheists are saying sciencey things that they want to hear. "What are you jawing about, Cowboy Bob?" 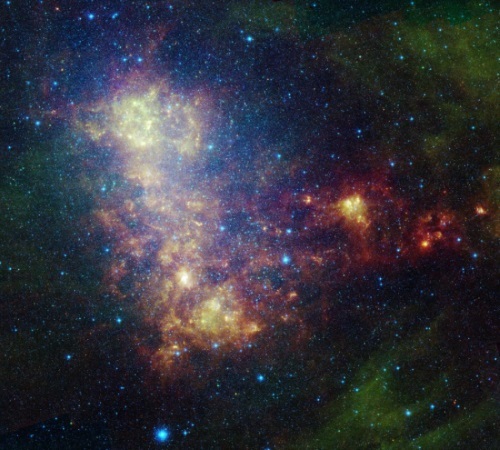 Regular readers have seen posts about outlandish science speculations. Before I get to the things that got me on the prod, I'd like to show you this one: "An Exciting Theory of Flower Origin", and you can see how Darwinian dogma drives interpretations of evidence. One other item before the main event. Jerks. No, not you. There's been some evosplaining of why obnoxious people exist, and why we need them. Al Mohler discusses this on The Briefing. It's in the last six minutes of the podcast, or you can read the transcript. Look for "The evolution of jerks: Can the central doctrine of the secular age function as a theory of everything?" I have some more bad science that came across my hearing bones from Todd Friel and the gang at Wretched Radio. This is the stuff that got me all het up in the first place, and I was able to add those other two items before this here article got published. Way back yonder, we developed gossip, pride, and ostracism — for the sake of survival. We learned to work together. No evidence, of course, just guesswork. NASA landed InSight on Mars to learn how all rocky celestial bodies in the solar system formed. Of course, they are assuming that scientists agree on the nebular hypothesis concept for the formation of the solar system (they don't all agree, though). Also, this is presuming an ancient solar system and ignoring all the indications that our solar system is actually young. This one really takes the rag off the bush: space alien robots may have already visited Earth, but we didn't know it. After all, they were different and we weren't capable of realizing what they are. See, I could have done that and been paid handsomely. Know who pays these jaspers? You and me, through our tax money. Can't be admitting that God created the universe, and he did it recently. At least, not according to secularists. The truth about origins is clearly set forth in God's Word, old son. We need to find out what he says. Unfortunately, people do not want to know the real truth. Postmodernism and "relative truth", sure. The ultimate truth of God's Word? People relish their sin too much for that. Here is a video I assembled with audio from the Wretched Radio shows on December 4 and December 11, 2018. As for my desire to be a science fiction writer, there's one other problem: I could not come up with such outlandish ideas that are presented as actual evolutionary science. To be an atheist or anti-creationists, someone has to believe in secular "miracles" of some sort. They believe in billions of years, the Big Bang, fish-to-fool evolution, and more despite evidence, not because of it. One of the most feather-brained bits of gullibility is that dinosaurs evolved into birds. If you study on the notion for a spell, you'll see that there's a passel of changes needed — far more than just having dinosaurs grow feathers and wings, then shrinking. The bone structure, breathing apparatus, the complex feathers themselves, and more need to be considered. Quite a few miracles of evolution. There are some links to help you out at "No Evidence for Dinosaur-to-Bird Evolution". Modern bird fossils are found in the Cretaceous, and other problems are found to thwart the evolutionary timeline. The birds are extinct, but they lived and flew when dinosaurs lived. Darwin's disciples still manage to conjure up their version of secular miracles and then slap some fact-free sciency terminology on them. The truth is that both dinosaurs and birds were created separately and recently. Very little seems different from modern birds, except that some had teeth in their beaks and claws on their feet. The particular enantiornithine discussed in the article, named Mirarce eatoni, was found in Utah’s Grand Staircase-Escalante national monument in 1992, but not analyzed in detail till now. Said to be 75 million Darwin Years old, it was the size of a turkey vulture. The fossil had exceptional preservation for enantiornithines, which are found around the world but usually flattened or fragmentary. This one was found in 3-D, allowing more details about its anatomy and physiology. To read the entire article, click on "Extinct Cretaceous Birds Flew". Believers in the uniformitarian deep time approach to geology claim that the Genesis Flood is rejected because there are not enough rocks on Earth. However, this is actually a tall tale that secularists like to spread. In a similar manner to refuting human evolution by looking at the evidence, uniformitarian dogma does not hold water. When conducting investigations of sedimentary rocks, it was discovered that the deep time assumptions caused some hard problems for geologists. Important factors were downplayed or ignored, such as stages of erosion and varying thickness of rocks. Worse for them, current rates of sedimentation are too high. (This also has some mighty big implications for fossil dating.) Naturally, secularists commenced to some fancy storytelling and obfuscation, with a heapin' helpin' of circular reasoning. If they hadn't rejected the Genesis Flood out of hand, they would be able to account for what has been seen and tested. Since its inception, uniformitarian geology has argued that the Genesis Flood could not have deposited the volume of sedimentary rocks found in Earth’s crust. This rhetoric has effectively diverted attention from the problem the sedimentary record creates for uniformitarian geology. An actualistic comparison of observed modern sedimentation rates to the total volume of Earth’s sedimentary rock demonstrates that the real volume is surprisingly small relative to modern rates. This problem is reinforced by observed rates of erosion, which should have produced a much greater volume of rock than observed. Auxiliary explanations are advanced to account for these discrepancies, but the fact remains that the volume of the sedimentary record is no friend of uniformitarians. This discrepancy offers them three unpalatable choices: (1) Earth is not billions of years old, (2) the rock record is not a representative record of history, or (3) actualism is a poor forensic assumption. The rest of the article is rather long, and it is helpful if the reader has some knowledge of geology. 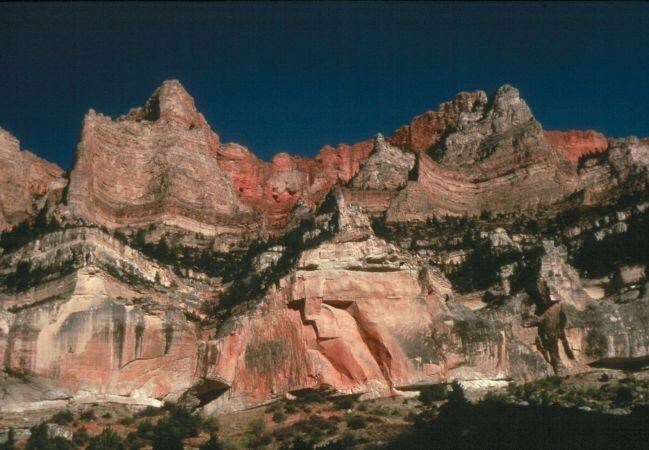 To read more, click on "Not enough rocks: the sedimentary record and deep time". Good science can be had by studying the work of the Master Engineer in nature, then finding ways to implement them for our own lives. The field of biomimetics is rapidly growing, with new applications being considered frequently. Some of these come from sources that may seem startling, such as the black widow spider. This infamous arachnid causes folks to yell, "Katie, bar the door! ", which can be counterproductive if the thing's inside with you. But although their venom is somewhat dangerous (less so for healthy adults), antivenom exists. Just don't be fussing with it, you savvy? You might consider calling an exterminator if they're in your home. Or maybe one of the researchers. Spiders have always been spiders, and they show no signs of having evolved from something way back when. Researchers want to know about their webbing, since it is proportionately very strong and they have some interesting ideas to implement. Like the spider has always been a spider, scientists were surprised at the specified complexity of the arachnid's web apparatus. 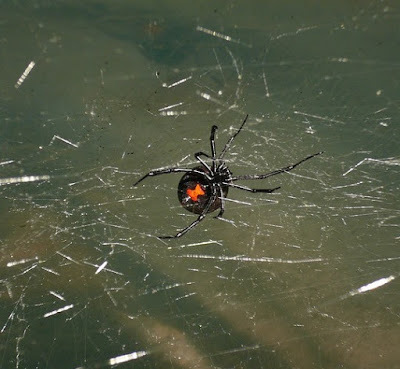 To read the entire short article, click on "Amazing Design of Black Widow Web Silk". Have you ever had some kind of parasite like a tick or something on your skin? If it is obvious, you may remove it yourself. Other times it may be in a place that is difficult to reach, so you need to get expert help. Since fish do not have hands, they need assistance with parasites, so they visit the local wrasse cleaning station. You may have seen videos of the cleaner wrasse being helpful in the sea, getting mutual benefits by cleaning much larger fish. They get some victuals, and other fish get parasites removed. The whole thing is quite amazing, since some of the clients are much larger than wrasses but do not eat them. Customers may have to wait in line for service. The wrasse is safe while at the neutral zone, but if it goes away to get more clients for the cleaning station, it may get chomped. Darwinists are baffled because the whole thing goes against their views. Since the narrative drives the evidence, the mutual benefit aspect was falsely dismissed and refuted. Also, the benefits are for the customers are more than just parasite removal. This is another example of the Master Engineer's handiwork and provision for his creatures. Cleaner wrasses are one of the most recognizable of reef fish. 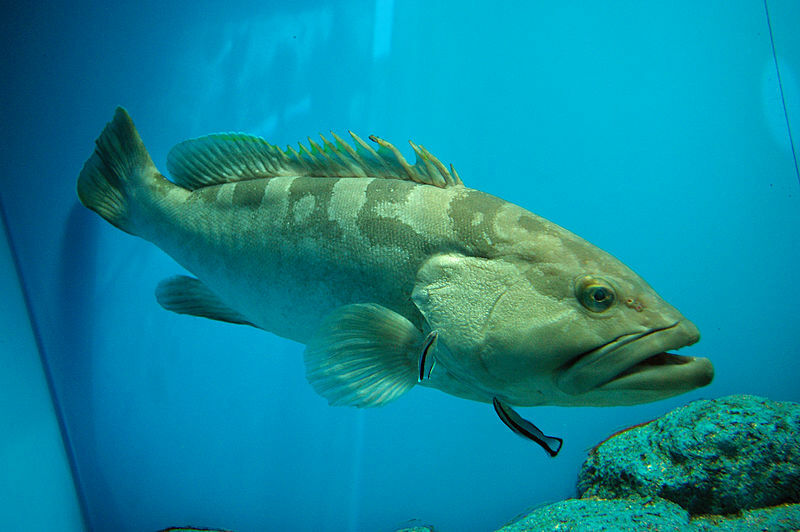 They have become famous for their cleaning behavior and are much sought after as aquarium fish for this purpose. Some studies have even suggested that cleaner wrasses are smarter than chimpanzees. While, until recently, they have not performed well in aquaria and thus have not been recommended, their wild behavior provides evidence for God’s marvelous design in his creation. Cleaner wrasses exhibit symbiotic behavior with numerous creatures on the reef around them. Symbiosis is a long-term relationship between two organisms. There are three types of symbiosis: the one exhibited by cleaner wrasses and their clients is called mutualism. In this type of symbiosis, both the wrasse and its client fish get a benefit to their survival. This is a crucial concept to keep in mind when discussing the cleaner wrasse. To FINish the rest of this fascinating article, click on "Cleaner Wrasses Demonstrate Providential Design". There is prairie schooner-full of methods used to calculate the age of the earth, the solar system, and so forth. None of them are very accurate because assumptions have to be made before those calculations are made. Some, like the Milankovitch theory, as based on circular reasoning. Even so, adherents of cosmic evolution continue to use fundamentally flawed dating methods because the alternative (a recently-created universe) is rejected out of hand. One bad method that persists is crater count dating. This method has been crashing (heh!) for a long time (see this 2012 article, "Crater Count Dating Still Unreliable"). Basically, the idea is that if a surface has more craters, it is older than surfaces with fewer craters. Nobody knows the rate of objects smacking into a moon or other object. Worse, when an impact occurs, stuff gets kicked up. Lots of it. Since we're talking about this happening in places with low gravity, it takes a while for the debris to come back down. This can give a false appearance of age (which was assumed anyway), because the new impacts are actually leftover from the previous smacking. Now some secular scientists are catching on to this problem. A standard method for inferring the ages of planetary surfaces continues to be plagued by bad assumptions. We’ve reported before about the problem of “secondary craters” in crater-count dating. 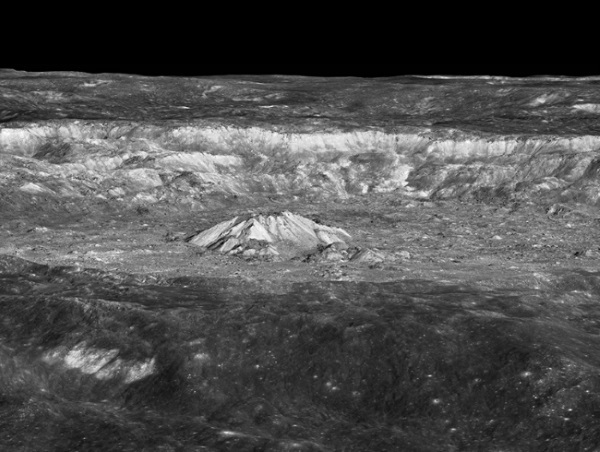 * Planetary scientists have long used crater counts to estimate the age of a surface. In short, the more craters, the older the surface. That seemed reasonable until secondary cratering smudged the theory. A single large impact (the primary) could launch up to a million pieces of ejecta (the secondaries) that fall back down, forming additional craters – all from that single event. Some large pieces could orbit for centuries before falling, and some could even travel between moons, messing up the ages of different bodies entirely. These realizations have tended to vastly reduce estimates of surface ages – not increase them. The assumption of ‘one impact = one crater’ is not necessarily true. To read the entire article, click on "Crater Count Dating: Self-Secondaries Reduce Age Estimates". The first part of this article will be short and, I think, amusing. I wrote "Artificial Intelligence and Evolving Morality" and then followed up with "Artificial Psychotic Intelligence". These addressed how some scientists and others want to use AI to discern morality, but AI is determined by the programmers, their biases, and the quality of the programming itself. Robots and other forms of artificial intelligence lack creativity. A couple of researchers at Google attempted to make a machine that would generate lyrics. The results were unimpressive, perhaps only suitable for the hands at the Darwin Ranch after boozing it up on payday or for 21st century pop songs. Not only do machines lack creativity, they don't properly deal with language itself. Now we're coming to the main part of this here article. Language evolves. Yes, you heard me right. But I used the word evolves very deliberately. Language changes over time, but that has nothing to do with Darwinian cogitations. I use some cowboy lingo, which came out West with people that originally lived in the South. Some of those expressions, in turn, can be traced to England. A more dramatic example of changes in the English language can be seen by taking a gander at the original and more current reading of the Canterbury Tales. Or maybe Beowulf. If you study on it, you may notice language changes in various regions or within your own lifetime. Language is an essential part of human communication, and it changes. I came across an article on Grammar Girl written by Neal Whitman, "Does Your Language Influence How You Think?" It discussed several things, including linguistic relativity. Simply put, your language may affect how you think. There may be some merit to that. Whitman discussed how a German court that officials cannot assume there are only two genders (a concept that denies both science and the Bible). 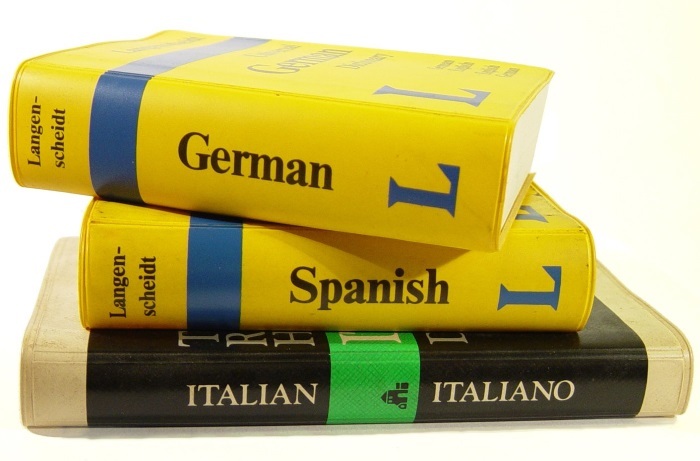 German, like other languages, has gender-specific words. To make a gender-neutral society, the language itself would have to change. While languages evolve, it's a mite difficult to force everyone to discard what has been built for many years for the sake of a few confused folks. It seemed to me that the author was in favor of making people accept such drastic changes. This could possibly change the way people think — at least, according to some secularist viewpoints. There are times I have seen where language influences my own thinking. It happened when I was learning computer programming languages and I had to learn to think about how a computer would accept my code. Also, I have read older books where the authors had richer vocabularies, and it seemed to influence my thinking for a while. You may want to try that little experiment yourselves. Christians, are you spending time reading God's Word and learning to think the way a Christian should think? Maybe you're spending your time watching movies and reading things that you cannot imagine joyfully sharing with Jesus. You should want the Bible to influence your thoughts, not the things of the world. Just something to consider for your spiritual lives. Language is something that is a gift from our Creator — minerals-to-minion evolution had nothing to do with it. Yes, languages changed over time (especially after Babel), but that is not Darwinian evolution. Language, creativity, and creative language set us apart from the critters. We communicate on a higher level than the animals. There are limits to language changes. Relatively speaking. Adherents of Big Bang-to-banker evolution, whether cosmic or biological, often resort to hidden causes. Since the Big Bang does not work, cosmologists bring in fudge factors and occult cosmology like dark matter, dark energy, and more to make their speculations seem plausible. Other riders for the materialist brand are using related terms to prop up Darwinism. In biology, these "dark" things are not just made up to make evolution look good. Instead, secularists are speculating about things they do not understand. "Junk" DNA, for example, was something that scientists did not understand, so they arrogantly declared significant parts of DNA to be leftover junk from our alleged evolutionary past. It's a natural fact that their hubris is vexatious. 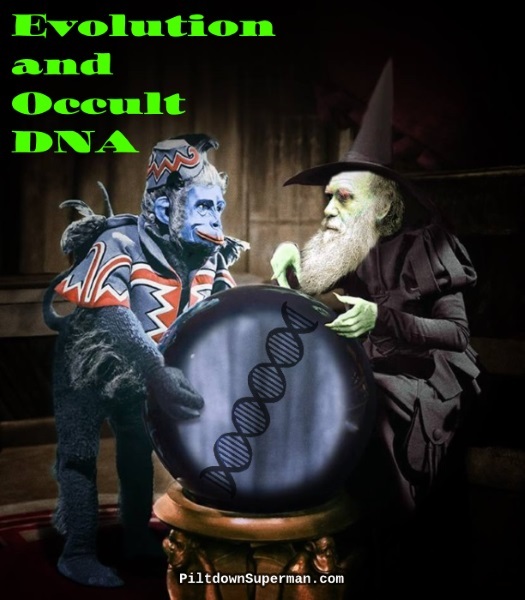 Now they are appealing to other "dark" things in biology, including DNA: dark DNA is the driving force of evolution. Of course, these owlhoots are presenting their occult thinking as "science", then Darwin's disciples get all excited and spread evoporn like this. As I keep saying, they go to a passel of effort to deny the fact that life was created, not evolved. In the biological world, references to “dark” substances can also be found. Microbial dark matter is a term sometimes given to microbes that are apparently in several different environments, but they have not yet been specifically cultured in a laboratory setting. Instead, their presence is indicated by detection of their DNA or RNA in various samplings. In the same manner, chromosomal DNA with no known function (aka, junk DNA) has occasionally been referred to as biological dark matter. It is not that this DNA is undetected, but simply its function remains undetermined. Thus, the only thing “dark” about biological dark matter is human understanding. To read the rest, click on "Is Dark DNA Evolution’s Secret Weapon?" The dominant principle in old earth geology is uniformitarianism, which essentially means that present processes are the key to the past. Secular geologists shun catastrophic processes for the most part, but it puts burrs under their saddles when they are forced to invoke them on occasion. Of course, the global Genesis Flood is rejected out of hand. Such biases make for erroneous geological studies; some things are unexplainable from deep time conjectures. Take cold slabs and subduction, for example. You have probably heard of plate tectonics, where plates on the earth's surface move. Secular scientists are unable to determine how plate tectonics began. The most popular model among biblical creationists is catastrophic plate tectonics, which began with the Genesis Flood. Plates do not simply collide. Subduction happens when one plate is forced under another one. There are oceanic slabs of rock that are far too cold to be explained by secular geology, and the more they study these slabs, the worse things get for their worldview. Since the 1990s, cross-section images of mantle tomography have shown visible slabs of oceanic lithosphere (which includes oceanic crust) descending hundreds of miles beneath ocean trenches into subduction zones. These descending plates have been imaged all the way down to the top of the earth’s outer core and are composed of cold, brittle, dense rock about 62 miles thick. Researchers from the University of Colorado recently reported finding that some of the subducted slabs stagnate at depths of about 670 km (416 mi) to 1000 km (620 mi) and appear to travel horizontally. To read the rest, click on "Cold Slabs Indicate Recent Global Flood". Many of those who believe in an ancient earth like to point to zircons as if they were conclusive proof of their views. Zircon dating is often trotted out by owlhoots who want to play the "Gotcha!" game, not realizing that zircon crystals have their own problems, such as the presence of carbon. Now some secular scientists are raising serious questions. Detrital zircons contain traces of uranium and lead. Researches took some from a pile at the base of a slope and the results were surprising. In fact, the researchers are showing that assumptions (which always occur in radiometric dating) may be not only biased, but biases may appear that other scientists are unaware of. Kind of hard to get reliable indications of an old earth when the dating methods are fundamentally flawed. Zircons are a gold standard for dating. They can yield ages that are statistically significant, but geologically meaningless. How confident are geologists in the ages of formations they study? The story often told is that radiometric dating produces dates that are super-reliable, because lab rates of radioactive decay don’t lie. The part of the story not told, though, is that many sources of bias can creep in. What constitutes a good sample? How many samples must be collected to converge on a reliable date? How far and wide should samples be collected? What should the geologist do with anomalous samples? Does statistical convergence necessarily translate into geological convergence? Can ‘reliable’ statistical dates be way off? To read the rest, click on "Detrital Zircons Can Give False Geological Ages". The other day I stopped at Stormie Waters' cabin, and she wanted me to get a knot out of the chain for her jade pendant. Then I commenced to pondering on knots. Cowboys use them to keep things from falling off a pack mule, sailors know all sorts of knots, neckties have special knots, and so on. I was surprised to learn that people study the things because they have mathematical properties. There are various shapes and twists found in nature. One that fascinates me (mayhaps you as well) is the Möbius strip. You may have made those things as a kid, just cut a long strip of paper, give it half a twist, and attach the ends. It has two sides. No, one side. 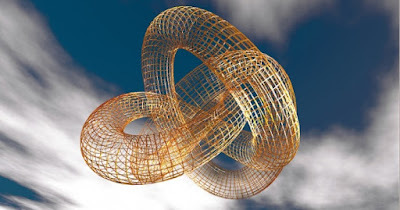 Wait... From there, we can have the Möbius knot and really go nuts, staring and playing with it. Mathematicians love them. Knots and other fascinating, complex shapes are found in nature. Various creatures knot themselves and then undo the knots as they see fit, and even DNA can be found to have Möbius patterns. Even the knots in nature give silent testimony to the wisdom of the Master Engineer. Knots do more than just keep necklaces on and tie things down. A stressed-out person may be described as “tied in knots,” unable to relax or make good decisions. Mathematicians, in contrast, find knots fascinating, and some of them devote their lives to the math of knots, including computer modeling to understand all their twists and turns. It may sound like an armchair interest with no practical value, but read on. You can read the rest of this short but very interesting article (and consider the "experiment" afterward) by clicking on "When a Knot Is Not a Knot". Folks that believe the universe is billions of years old should have been abused of that notion because of observed data. Unfortunately, the atoms-to-astronomer narrative drives the interpretation of information. Dust rings around a distant star? Must be a planet forming, right? Not at all. When a galaxy does not fit the cosmic evolutionary worldview, it's time for "substantial revision", and they race around like snakes fleeing a brush fire. Other examples of a young solar system? Make excuses or just ignore them. Here are two more items for secularist owlhoots to ignore. Blue stars are nice and hot. They are also fuel hogs, so they should not be in galaxies according to the standard mythology. Using deep time reckoning against secularists, spiral galaxies with blue stars cannot be quite so old. Also, we have neutron stars in globular clusters. They should have gotten out of Dodge a long time ago, but there they are. The evidence is abundant: the universe was created recently. To read the short article about these two problems with stars, click on "‘Star witnesses’ to a young creation". In previous posts, we have looked at several instances of geomorphology, such as planation surfaces and the like. Today we are going to focus on inselbergs. No, Inselberg was not a musician in a German rock band (that I know of), but it the word came from German and means island mountain. We have a passel of them in the USA (such as Stone Mountain), but there are many of them around the world, and they puzzle deep time geologists. You could be eyeballing a plot of land and suddenly see a huge bump or series of bumps. According to uniformitarian geology, everything happens over long periods of time. Geologists cannot adequately explain how they appeared. To make matters worse, inselbergs are showing signs of erosion that do not fit deep time speculations. The global Genesis Flood provides the most logical explanation for what we observe — which means that Earth is far younger than secularists and stalkers want to believe. As the world’s continents were uplifted from the waters of the global Flood, they were greatly eroded. During this massive erosion, the rocks that weren’t pulverized were transported hundreds of kilometres toward the oceans. The enormous power of the receding water, relentlessly shaving off the surfaces it flowed over, left behind large flat areas known as planation surfaces, along with coastal Great Escarpments, large natural bridges, and freestanding arches. Scientists studying conventional geomorphology find all these features puzzling because they ignore the Flood and rely only on slow erosion over millions of years, which does not work. 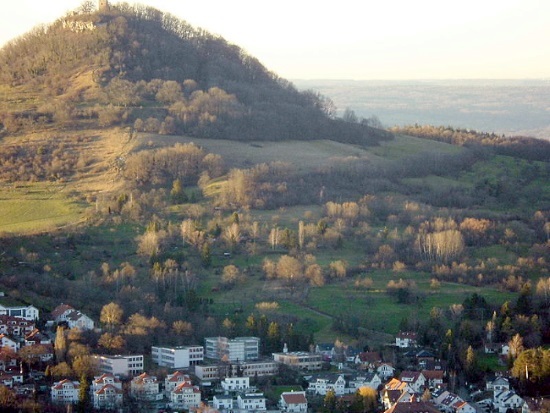 To read the rest, click on "Inselbergs — Evidence for rapid Flood runoff". I think Inselberg would be a good name for a rock band.